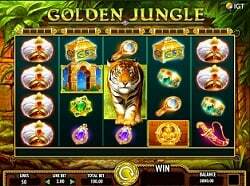 Golden is the latest new slot from NextGen Gaming. Normally with this developer, we see satisfactory graphics, but with the Golden slot machine game, they have really tried to boost the quality, almost to a 3D level. Golden is all about a rooster, and it may be mere coincidence that it has been released at a time when it is the Chinese Year of the Rooster, but it certainly feels fitting. Golden offers up a total of 5 reels and 243 paylines of farmyard fun, coupled with the same selection of features we are used to seeing from NextGen Gaming. This new slot machine contains the same NextGen Gaming wagering menu we’ve said countless times in their earlier slots. However, just like the graphics in this game, the wagering menu has had a bit of a revamp, so it looks far snazzier than we’re used to. It does the same stuff as always, though, so expect to be able to use the up and down arrows to select bets which range from a floor of $0.25 per spin, up to a ceiling of $250 per spin. Of course, you aren’t going to be able to adjust the paylines in this slot. Wild symbols: In the base game, wild symbols appear as roosters. They can only appear on the second, third, and fourth reels of the slot, and substitute for all other symbols, including the scatter icon. Scatter symbols: Scatter symbols can only appear on the second, third, and fourth reels of the slot. They can offer you an instant cash prize worth 50 coins if 3 appear on the reels. Three scatters will also trigger this slot’s bonus round. Scatter wild symbols: Wild symbols in the free spins bonus round double up as scatter icons in this slot. These symbols appear as golden roosters, and they can appear on the second, third, and fourth reels of the slot. Scatter wild icons can substitute for all other symbols in the game without exception. Free spins bonus: As we’ve said, there are perks to this free spins bonus, not least the scatter wild symbols. Players will begin the feature with a total of 10 free games, and any five-of-a-kind wins will be multiplied by 5x the normal rate of pay. You can trigger the feature again by landing more scatter wilds on the reels. Golden has a theoretical return to play (RTP) rate of 97.222%. This is profitable for any slot machine. To win a non-progressive jackpot in this slot machine, players are going to need to line up 5 of the early morning rooster/fence symbols on any active payline. The true name of this symbol is not known, and it is not easy to explain but you will quickly identify which is the best paying symbols once you start spinning the reels of the Golden slot. Golden (or Golden Rooster, as it is being called in some circles) is a decent release and shows that NextGen Gaming are making strides forward in the right direction. The slot is a little puzzling at times, but most players will find the same loveable NextGen Gaming gameplay underneath this new coat of 3D imagery.